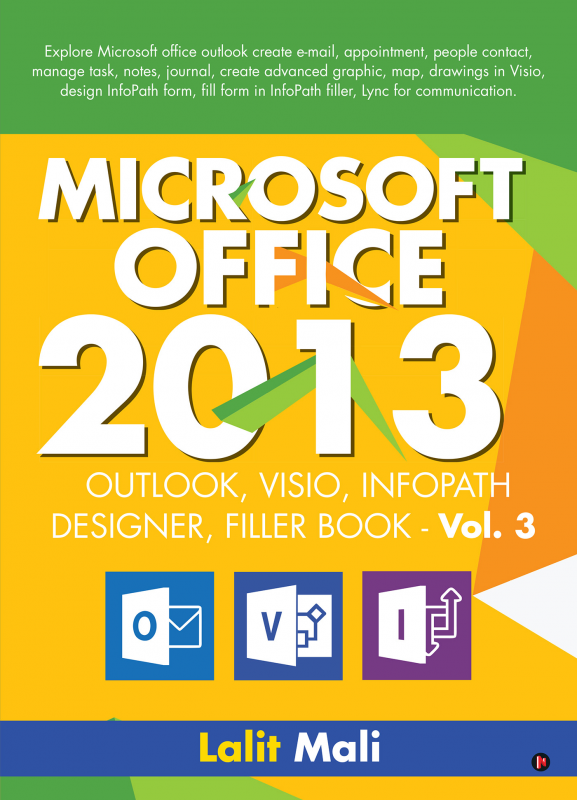 Microsoft office - 2013 Outlook, Visio, InfoPath designer, Filler Book - Vol. 3 Explore Microsoft office outlook create e-mail, appointment, people contact, manage task, notes, journal, create advanced graphic, map, drawings in Visio, design InfoPath form, fill form in InfoPath filler, Lync for communication. Microsoft Office Outlook provides complete office assistance and is a personal information manager that allows its user to carry out professional tasks such as managing e-mails, business appointments, calendar schedules, and notes generated information. It helps create commercial tasks, add or store contact profiles and group contacts, store journal information and more. Microsoft Visio’s map, 3D vector, and designing software permit its users to insert various kinds of graphic stencils, shapes, clip art, small graphic symbols and pictures to create the kind of drawings that fulfill user needs. It also helps explore or navigate various Outlook Visio functions and controls according to the user’s needs. Create InfoPath designs all kind of form, inserts various form control names, text boxes, list boxes, labels, tabs, browsers, tables, charts, ActiveX controls in design windows, creates codes or logic. InfoPath Design forms controls, using InfoPath fillers to fill InfoPath design created forms and elements. The additional attributes of Lync application allow instant meetings, voice and video multimedia conversations, and more. It uses cloud for storage and provides access to cloud storage, all kinds of Microsoft document extensions, and access for global platform needs. Lalit Kumar Mali has been in the field of Information Technology from the year 2000. He has done “O” and “A” level M.Sc/CS and “B” level interim from NIELIT. The author has expertise in Windows, Linux, Unix, Mac and Android OS along with C, C++, Java, C#, F#, asp.net, java.net, awak, Shell, FoxPro, visual basic.net. He has worked with open source technology for several years in exploring and describing new topics about these technologies. At present, the author is working as a computer instructor and as an equity and commodity trader.